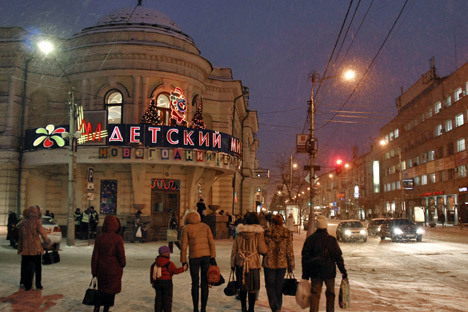 Krasnoyarsk, a major stop for travelers on the Trans-Siberian railway, is almost 1,500 miles from Yekaterinburg, one of the big destinations on the journey from Moscow to the east. It took 37 hours to make the trip between Krasnoyarsk and Yekaterinburg by train. With beautiful Siberian scenery outside the window, the journey passed in a haze of questioning. We said goodbye to our new friends when the train arrived in Krasnoyarsk. We had made reservations in the Kiwi Hostel; a short bus ride from the old part of the city. It’s a great hotel – if slightly difficult to find – but unfortunately check-in opens only at 2 p.m. We called a member of the hotel staff to let us in and then decided to go grab something to eat at a nearby coffee shop. Half an hour later we were joined by Alex, who had left a wedding to let us in to the building. Oops.